The fast, easy way to remove loose fill, foam insulation or dust. 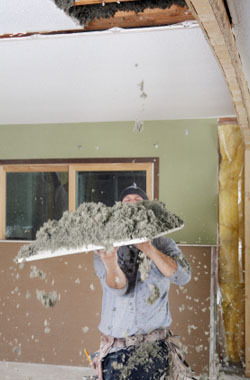 Installing loose fill or spray foam insulation appears to be a fast easy process. But the fact is that problems can often develop that require its removal. And that can be a real headache. Now there's a fast efficient way of solving that problem and it's available from Kings. Many home owners have discovered to their dismay that the foam insulation in their ceiling space has disintegrated into a fine, dusty powder. This could be a hazard to asthmatics and allergy sufferers. The thermal insulation effectiveness of this product will be minimal. Structural problems with ceilings can develop over time and may necessitate ceiling replacement or repair. The presence of loose fill insulation makes that a difficult job. We can vacuum all or part of the loose fill insulation to enable the repairs to proceed. Some insulation has insect problems. Kings has received requests from home-owners for removal of loose-fill wool insulation due primarily to insect infestation (carpet beetle). Repeated treatments by pest control specialists have, in the past, proved ineffective and total removal of the infested insulation has been the only option. We can solve the problem. Dust, sand or leaves in your ceiling? Home-owners living in coastal areas (particularly those with tiled roofs or open eaves) may find a build up of beach sand in their roof space over a period of years. We can solve the problem. Equally, those living in a bushland environment may find a build up of leaves creating a potential fire hazard in their roof space. We can solve the problem and vacuum the ceiling clean. Kings removal and clean-up service. Kings are experts in safe professional removal of unwanted insulation material and our vacuum machine is an extremely efficient heavy duty vacuum system. For an average home the removal and clean up process takes less than a day. If you are in any doubt about the insulation material in your ceiling, call Kings. They can tell you exactly what's in your roof and what should be done about it. Gold Batts - the ideal replacement insulation. Removal of your old insulation will solve one problem but, naturally you won't want to leave your home unprotected. Kings have been in the insulation business for over thirty years and we know it well. That's why we have no hesitation in recommending Gold Batt insulation. Gold Batts provide guaranteed thermal resistance ratings for optimum summer and winter performance. Kings can insulate your clean ceiling with Gold Batts at extremely economical rates. And, all our work is fully guaranteed!